The Lenovo ThinkSystem DS4200 is a versatile storage system designed to provide simplicity, speed, scalability, security, and high availability for small to large businesses. The ThinkSystem DS4200 delivers enterprise-class storage management technology in a cost-effective solution with a wide choice of host connectivity options, flexible drive configurations, and enhanced data management features. This product guide describes the Lenovo ThinkSystem DS4200 and provides essential pre-sales information to understand its structure, key features and specifications, components and options, and configuration guidelines. This guide is intended for technical specialists, sales specialists, sales engineers, and IT architects who want to learn more about the Lenovo ThinkSystem DS4200 and consider its use in IT solutions. 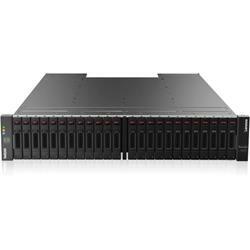 The ThinkSystem DS4200 is a perfect fit for a wide range of workloads, from specialized workloads such as big data and analytics, video surveillance, media streaming, and private clouds to general purpose workloads such as file and print serving, web serving, e-mail and collaboration, and OLTP databases. The DS4200 is also suited very well for secure archive storage or a consolidated backup solution. The ThinkSystem DS4200 supports up to 240 drives with up to nine external expansion enclosures. It also offers flexible drive configurations with the choice of 2.5-inch and 3.5-inch drive form factors, 10 K or 15 K rpm SAS and 7.2 K rpm NL SAS hard disk drives (HDDs) and self-encrypting drives (SEDs), and SAS solid-state drives (SSDs). The DS4200 can be scaled up to 1.84 PB of raw storage capacity. The ThinkSystem DS4200 supports Intelligent Real-time Tiering capabilities that help optimize system performance, reduce costs, and simplify management. The base software includes the ability to move data dynamically between SAS HDDs that are optimized for cost per IOPS and NL SAS HDDs that are optimized for cost per GB. With the optional software license, the DS4200 supports hybrid tiering across HDDs and SSDs. The ThinkSystem DS4200 offers the flexible choice of 12 Gb SAS, 1/10 Gb iSCSI, and 4/8/16 Gb Fibre Channel (FC) host connectivity protocols, with support for hybrid iSCSI and Fibre Channel connectivity at the same time. The Converged Network Controller (CNC) design of the DS4200 makes the selection of iSCSI or FC host connectivity as simple as attaching corresponding transceivers or Direct-Attach Copper (DAC) cables to the SFP/SFP+ ports on the controller module. The ThinkSystem DS4200 supports battery-free cache protection, which reduces maintenance costs and provides permanent backup of unwritten cache data if there is a power failure.